Did you know that the modern lift station no longer requires a wet well? This may be a surprise to some, but it’s true. If you manage wet well lift stations, you have an idea of the costs involved just to keep the wet wells clean. Perhaps you use a vacuum truck or a contractor firm to pump out the mess and pressure wash on a regular basis. You may have them “on call” if you have problems with submersible pumps. Read on to find out how you can end these wastewater pumping expenses forever. How about not needing that valve vault and that maintenance? Wouldn’t you be happier if there were half valves to manage and support? 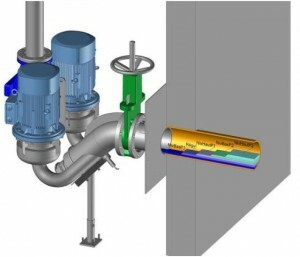 What could you do with the extra space a valve vault requires? Consider what you could save here. Do you ever have problems with those guide rails—those pipes that attempt to align the old submersible pumps to engage the discharge flange? If they are not stainless steel, are you planning to replace them? Do you sometimes strain to lift the pumps? What if you no longer needed to deal with guide rails at all? Stick with me and I will explain. Are your trash baskets becoming “a way of life?” How many trips do you make to pull up and dump the trash out? Have you ever estimated the cost of all this trash hauling? You may be amazed or even shocked at what it costs to travel to the lift station, pull and empty the trash baskets, then haul and dispose of what you have collected. This can end! Do you use a bar screen and rake system? This would typically include a screw compactor to compact the trash collected by the screen. This expensive addition to a lift station doesn’t eliminate the trips to the station to pick up the compacted trash; you still have to haul it and dispose of it properly. You have not eliminated the trips, the labor, and the time needed as a trash collector. You can stop this waste! Many folks have or are considering adding a grinder or macerator at their problem lift stations. While this may save trips, you still have the great expense of the addition of equipment that itself will require regular maintenance. It is not a “set and forget” product. You will have some relief from pulling the clogged pumps but there will come a time to repair or replace the cutting mechanisms, again at great expense. All of this can be avoided as you will soon see. Are your lift stations representing you as being a good neighbor? Or, do you get complaints about the odors emitted? Are you knocking on doors to apologize for the odors and spending your budget monies on unneeded chemicals and the time to dose? Do the neighbors know that with a wet well, there is always retention of raw sewage nearby? Why would you continue to do this when it can easily be a thing of the past? Are the iron and steel components in your wet wells corroding away? Is the concrete well itself being deteriorated until it will require expensive liners or special coatings to save it? Are you having issues with electrical fittings becoming corroded? Have you calculated the annual maintenance costs of each wet well? Or do you want to forget this major expense for all time and gain a new life? What do you do when you have problems with Fats, Oils, and Greases (Fog)? Are you spending additional funds on compressors and bubblers or chemicals? How often do you have to make a trip to the station just to clean the float switches? What if these problems would just go away? They can and will with the right technology. For example, with a modern pumping system, no float switches are used. Also with a modern, innovative system, if needed, you can change an impeller is as little as 15 minutes with common tools. Compare that to the outdated submersibles you now use. Do your 1950’s design submersible pumps (not much has changed since then!) have a stone and grit trap that is easily serviced when or if needed? Or do you still need a vac-truck to service the trap? There is a modern pump system that provides this as standard that you will learn about as we go on. Will your submersibles, even if new, start and stop up to 150 times an hour without heating up and stopping pumping? Will your submersibles run dry for up to 150 hours without a failure? I’m sure that you know that the submersible pumps in a wet well have now been used for 63 years. This is not what anyone would call innovative and modern. Why is innovation in wastewater pumping so important? Lifestyles in America have changed. Disposables are now part of everyday use. They will not go away even if you ask that they not be flushed. The submersible pump folks are having a problem and with 63 year old “technology” it will continue. If you’ve read this far, you’ve discovered that you are still doing what was being done over 60 years ago. Many things have changed since those years except the old cast iron submersible pumps. What if you had pumps that automatically cleaned themselves? And I don’t mean by a momentary reversal to pass a rag ball on into the system. What if you had pumps that were to shred materials that typically wraps and clogs? What if the pumps would do this without your even knowing about it? As I said, automatically! What if you could eliminate trips to the lift stations? This is now being done, and you can too! What if you could manage your lift stations remotely? I said “manage” and not just “monitor” as the older technology is now doing to try and catch up. You can manage your lift station pumps from anywhere, using the Internet, with a smartphone, a tablet, or a desktop computer. You no longer have to make a trip to the station to make an adjustment in how the pumps run. Do it from home when “on call” or from your office or the cab of your truck. Manage one lift station or many…Just a password for each station is all you need. You can view the operation of the station’s pumps and you can order reports to be printed for each as needed. As you can see, there are problem-solving systems to be had. You have just been through my quick presentation on the benefits of converting your old pumping system to the new, modern, innovative DIP System®. It is patented and proven with thousands in use. The DIP System® is designed to use your existing wet well and converts it to a clean, dry machine room. This ends the wet well concept and it’s maintenance forever! It eliminates the valve vault and the maintenance of one set of valves. No more problems with float switches or other retention measuring devices! It is made of all stainless steel that seals the fluids pumped ending the problem with Hydrogen Sulfide, the odors and the corrosion. It comes ready to install having been factory tested, pre-wired, and complete with control panel with VFDs. It typically installs in two days or less and has been done in less than one day!